This is one of the few Charles Reid books that were reprinted in 2016. I think it's great to make these books available again because they are insightful resources for any artists. 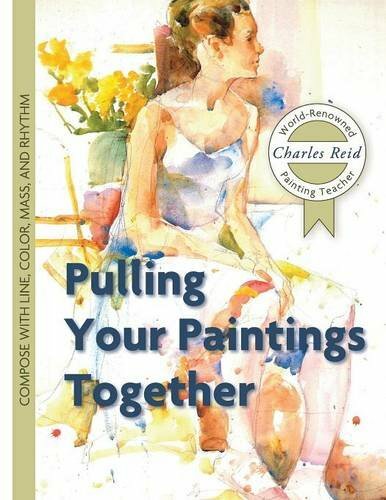 Previously, I've reviewed Painting What (You Want) to See by Charles Reid and The Natural Way to Paint: Rendering the Figure in Watercolor Simply and Beautifully. This 162-page instructional artbook talks about techniques you can use to make subjects in your artworks look more harmonious. There are drawing techniques with pen and ink, as well as painting techniques that involves using colours, understanding values and the use of positive and negative shape. The explanation is very insightful and this is a book you can pick up anytime and read on any page. It's a book worth revisiting in the future because many of the tips are things you can easily do to shake things up a bit, especially when you feel that your drawing and painting style is getting a bit monotonous. I find it interesting that he likes to start drawing from within the shapes of subjects. For example, when drawing people, he may start with the eyes. This is quite different from other artbooks that recommend drawing the general shape or outlines first. It's certainly interesting to learn about different ways to approach drawing. With Charles Reid's book, there are often little gems of advice waiting to be discovered. Towards the end of the book is a section that features his students' work. He gives his critique on the artworks and it's quite insightful to see how he does just that while explaining the rationale. Overall, it's an insightful book that I can recommend to people who sketch or paint. There's much to learn from the creative process of other artists, in this case from the loose and spontaneous art of Charles Reid.